Cupping is a simple method of pulling “stuck,” stagnant, and congealed blood and fluids out of the injured area. Plastic or glass cups are placed on the skin and then applied using suction. Cups are kept on from three to fifteen minutes, according to the judgment of the acupuncturist. Cupping releases tight, painful muscles and increases blood circulation. After any injury, areas that you hurt are areas that now have a blockage of blood and body fluids. Injured joints become swollen and painful. Backs become stiff, painful and difficult to move. This blockage of blood and body fluids that accompanies an injury is like a beaver dam. The force of the accident or injury creates the initial obstruction – the sticks, mud and leaves of the dam. Eventually, with time, the body may be able to unblock these injured areas and return to healthy circulation. Sometimes, even after surgery, the injured area continues to hurt, and never feels completely the same. That’s why you come to get acupuncture and therapy – to speed up the rate at which you heal, and to increase your body’s ability to heal itself completely. The joints, which have joint fluid, stuck blood, and white blood cells, minerals, nutrients all congealing in the area, become stiff and painful as these do not move along back into circulation a week after the injury, but instead begin to stick in the joint area, and sometimes even swell up. Tears and sprains are not able to heal as circulation is not repaired, and as the area is painful to use, one tends to keep it as still as possible…and not using the injured area at all can also prevent blood flow from circulating properly and thus healing the injury. 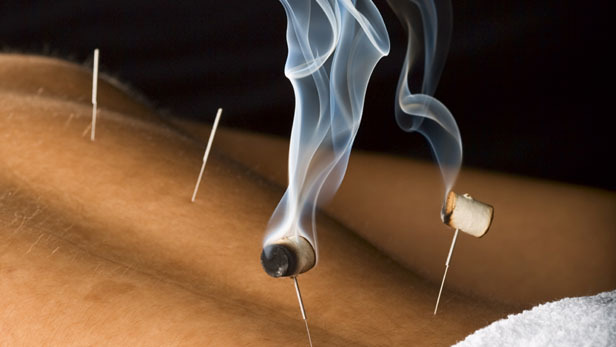 Indirect moxibustion is currently the more popular form of care because there is a much lower risk of pain or burning. In indirect moxibustion, a practitioner lights one end of a moxa stick, roughly the shape and size of a cigar, and holds it close to the area being treated for several minutes until the area turns red. Another form of indirect moxibustion uses both acupuncture needles and moxa.